Join us for an interactive discussion April 9 at 1 p.m. The following content is created in consultation with Main Line Health. It does not reflect the work or opinions of NBC Philadelphia’s editorial staff. Click here to learn more about Main Line Health's Lankenau Heart Institute. Register here to learn more about women's heart health in our free Healthy You webinar. How to view: Watch it live here. Can't make it April 9 at 1 p.m.? The webinar also will be available to view on demand. Did you know that one in every three women die of heart disease each year? Or that 90 percent of women have at least one risk factor for heart disease? Did you realize that women are less likely than men to survive their first heart attack? Despite increased awareness about heart disease, many women -- and even doctors -- still dismiss or misdiagnose its symptoms as stress or anxiety. Year after year, coronary heart disease is still the single biggest cause of death in the United States of both women and men. However, more recent studies have started to point out an alarming trend: a steady increase in the number of young women who die of coronary heart disease. 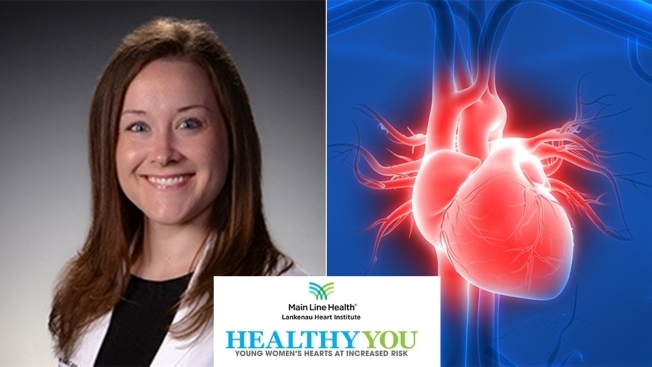 Join this interactive webinar with Lankenau Heart Institute experts on women’s heart health, including Dr. Katie Hawthorne, non-invasive cardiologist; Heather Forgione, Women’s Heart Initiative program manager; and Zakiyyah Morrison, heart survivor. Dr. Katie Hawthorne is a non-invasive cardiologist skilled in inpatient and outpatient consultative cardiology. She brings special expertise in advanced imaging modalities, including echocardiography and cardiac MRI. Hawthorne has a special interest in women’s cardiovascular health, and is an member of Lankenau Heart Institute’s Women’s Heart Initiative, providing program leadership and clinical education about pregnancy and cardiovascular disease. Hawthorne is also a member of the structural heart and valvular disease team and assists in image guidance for transcatheter valve procedures and various other structural heart procedures. Hawthorne earned her medical degree from Jefferson Medical College in Philadelphia and completed her residency in internal medicine at Massachusetts General Hospital. She completed her fellowship in cardiovascular medicine at Beth Israel Deaconess Medical Center affiliated with Harvard Medical School. To learn more about understanding women's heart health, register to watch this free Healthy You webinar by clicking here.